More than $200,000 was raised for Natalie's Cakes & More in 2 days. A Missouri woman whose business was vandalized in Ferguson protests was busy pushing out pies and cakes at her bakery on Thanksgiving, despite broken windows and damage to the store. 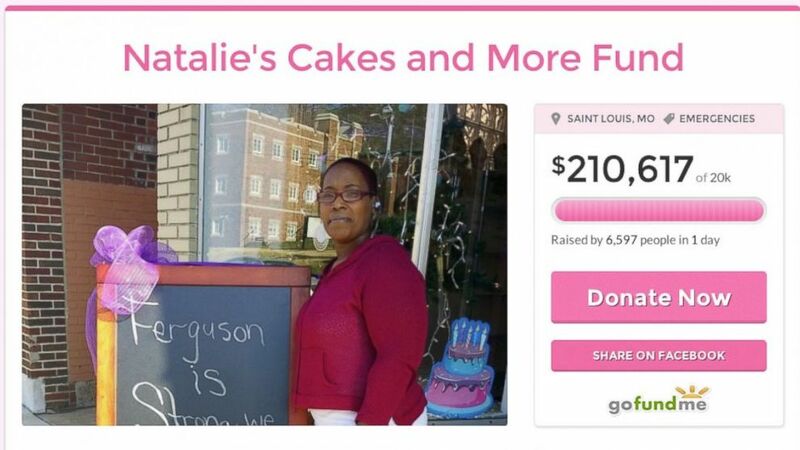 Supporters raised more than $200,000 in two days to help Natalie DuBose, the owner of Natalie's Cakes & More. DuBose said her bakery, which she opened this summer, was damaged when protesters rioted following news that police officer Darren Wilson had not been indicted in the shooting death of unarmed teenager Michael Brown. "My main windows were smashed and bakery damaged," she wrote on a GoFundMe page launched Tuesday. "I'm beside myself, but with the holidays, can't stop working. (GoFundMe) The GoFundMe page for Natalie's Cakes and More. Rioters smashed windows, burned down businesses and set police cars on fire late Monday in Ferguson after the grand jury's decision to not indict Wilson was announced. DuBose said she was in tears Tuesday after learning the violence had reached her shop, but a team of volunteers jumped to help her clean so she could continue baking. "I literally baked all day and night up until this morning," she told ABC News today. She thanked the volunteers who helped her with the deliveries and the supporters who raised cash for the bakery. Kristine Froeba, a supporter who's helping run the bakery's social media pages, applauded DuBose's hard work. "She's backed up with her Thanksgiving orders, she's baking around the clock, the phone is ringing off the hook," Froeba said. "She's so busy." DuBose says she's grateful for the financial support. "I am just overwhelmed with gratitude," she said. "I don't think it's even kicked in because I've just been trying to get these Thanksgiving orders out of the way. I'm overwhelmed with joy and just grateful for the support."